If you thought getting yourself out of bed for a jog through cold, rainy, or foggy morning air was hard, add in a few booby traps and lethal obstacles and you will have some idea of what it means to be a Grim Jogger. Grim Joggers is a platformer gaming app that makes running a marathon not only a test of strength and training, but also a test of courage and grit. 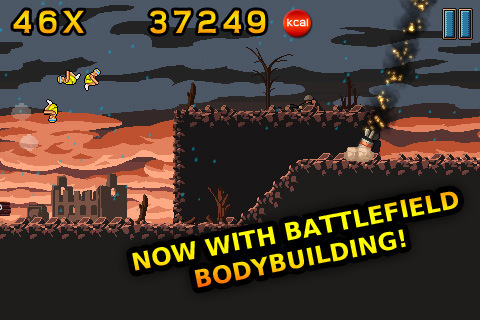 The game was released by 10tons Ltd. for an iPhone, iPod Touch, and iPad and costs $1.99. The trick when playing Grim Joggers is to have the quick reflexes it takes to jump over anything you see in your path that you think may cause you instant death. 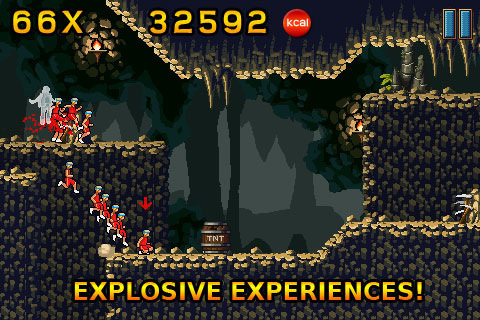 The game comes with 4 different types of rugged terrain including a wild jungle, a volatile mine, an arctic wonder world from hell, and a treacherous battlefield. You start the jogging out in the jungle, then make your way through the other worlds by unlocking them one by one. The last world is listed as “unknown” so it will most likely become available through future updates. In each of the levels there are six achievements to unlock. There are about 20 joggers at the beginning of the game and whichever one is at the head of the line controls the movement for the rest of the men. When you begin your run up and down the rough trail, the line of joggers looks like a centipede, but once you start going over obstacles blood goes flying all over the place and men begin dropping like flies. One of the best parts of playing Grim Joggers is that at the completion of each level you get a lesson about how many calories you just burned and what that amount is comparable to in the world of junk food. I am hooked on this game. Grim Joggers is somewhat disturbing and downright brutal at times—especially when you are running through the battlefield and limbs are flying—but it is easily one of the most entertaining platformer games I have played. Definitely go out and get this app…if you have the guts. AppSafari review of Grim Joggers was written by Vanessa Paszterko on March 16th, 2011 and categorized under Action, Adventure, App Store, Fun, Games, Platformer. Page viewed 4045 times, 2 so far today. Need help on using these apps? Please read the Help Page.